The white on the rock is guano. Before the invention of modern fertilizer, guano or bird droppings, were used by many farmers to enhance soil fertility and improve crop output. Guano could also be used as an explosive and military weapon. 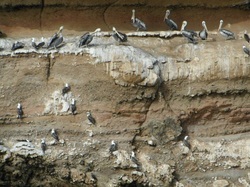 Off the coast of Peru and Chile there are large deposits of guano due to large populations of sea birds. Our group visited Paracas and the Islas of Ballestas in order to observe the birds and learn about the short yet charged guano industry. In 1879 Peru, Bolivia, and Chile began to fight over mineral rich areas in the War of the Pacific. Eventually Peru gained controlled of the Islas of Ballestas and Bolivia became landlocked. Currently Bolivia is one of the poorest Latin American countries in the region and many of contributed their status to their inability to access the ocean. After the war ended Peru decided to nationalize the guano industry and protect the sea birds that produce guano. The guano birds' natural predators were killed in mass numbers for sport in order to increase the amount of guano on the islands. Now that modern fertilizers and explosives have replaced guano, the industry has faded in Eastern Peru. As a result the Islas of Ballestas have been made into a protected area that tourists can only access on guided tours. At the end of the nineteenth century the frontier was beginning to close in the United States and many feared that America would lose part of its cultural value invested in the frontier. During the early twentieth century, people began to explore places outside the United States that were viewed as primitive hoping to continue a tradition of exploration. 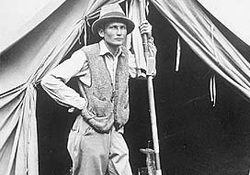 In 1911 Hiram Bingham traveled to Peru hoping to find ancient ruins that would make him famous. He paid a native a sol, which was about three times the daily wage, to take him to ruins. Although the boy did not know the significance of Machu Picchu that is were he led Hiram Bingham, making Bingham instantly famous. Hiram Bingham has been recognized for making Machu Picchu a world famous site and bringing the ruins into the public eye. He brought many artifacts, legally and illegally, back to Yale University. The artifacts that were legally removed from Peru were taken with the agreement that Yale would eventually return them to Machu Picchu. However, all the artifacts still remain in storage units in Yale. In the early 2000s Peruvian President Alejandro Toledo invigorated a battle between Yale University and the Peruvian government. He made the reclamation of roughly 5,000 artifacts a fight for indigenous rights and the Peruvian government has threatened to sue Yale University in order to gain back them back. 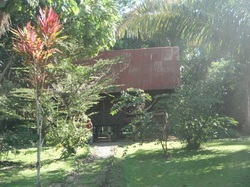 The Shining Path (Sendero Luminoso) was a group started by philosophy professor Abimael Guzman in Ayachucho, Peru in the 1980s. 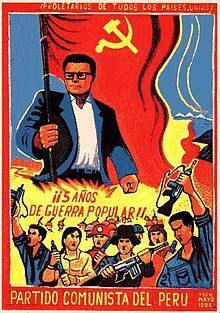 Guzman took on Maoist and Marxist ideas and tried to create a revolution to overthrow the government in Lima, often using propaganda and violence to gain new followers. The Shining Path, with several female leaders, became increasingly involved in car bombings, massacres of villages and in the cocaine trade, as they tried to lead a revolution. The Shining Path caused plenty of destruction in Peru in the 1980s. By 1990, new president Alberto Fujimori attempted to fight against the Shining Path using the military. However, Fujimori became a ruthless and corrupt dictator--one who controlled the media and military in order to scare and often kill innocent people for no reason. Despite catching Guzman and ending serious threat from the Shining Path in 1992, Fujimori continued this state of fear. By the time he was thrown out of office in 2000, many Peruvians felt he had become worse than Guzman and the Shining Path. The 1980s and 1990s were a time of violence, fear and chaos in Peru, but it is a time that has a significant influence on today's Peru, especially with the recent elections. When the bicycle and later the automobile were invented, the demand for rubber boomed. As a result, entrepreneurs and foreign investors purchased large tracks of land in the Amazon Rainforest were there are large populations of rubber trees. These men were commonly known as rubber barons because they brutally abused labor and land resources in order to build their fortunes. After synthetic rubber replaced natural rubber many foreign investors abandoned the Amazon Rainforest. In Acre, Brazil people have maintained rubber cultivation supplemented with subsistence farming. However, cattle ranching is encroaching on the land they use, destroying their livelihood. An indigenous movement to protect and preserve land has recently joined an international environmental movement to save the rainforest. The fight to conserve rubber tapping has demonstrated that protecting the environment can also build social equality. Tourism, and more specifically ecotourism, has increased in Peru over the last 10 years, especially with more safety and a more stable government since the fall of Fujimori's government. Peru is a country that is trying to grow economically, while also trying to preserve much of its environment, with a significant portion of its land in national parks. Today, Peru seems to be trying to develop its ecotourism industry the way Costa Rica has done with success in the 1990s and 2000s. Still, there remains a difficult decision about how many tourists to allow into the national parks (like Manu) and what to do with the indigenous people already living in the parks. Different people and groups have varying opinions on this situation, but what is clear, is that Peru's tourism industry is increasing, especially in areas unrelated to Machu Picchu and the Inca ruins.